BCCIC is happy to announce the second and final installment in our Theory of Change webinar series. 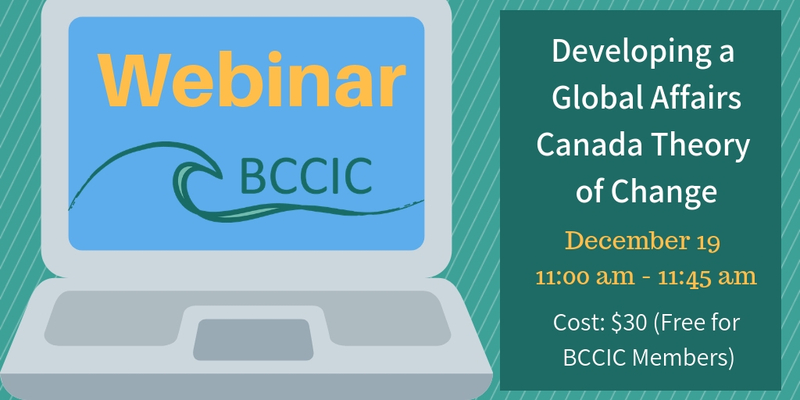 This webinar will focus on the development of a Theory of Change (TOC) for a Global Affairs Canada (GAC) application. The webinar will draw from the GAC RBM guide and will follow the TOC template from the previous Small and Medium Organization (SMO) call for proposals. Participants will be briefly guided through developing an effective logic model including the different results: outcomes, outputs and activities. The remainder of the webinar will be dedicated to writing the narrative of the TOC including assumptions and risks. The participants will be guided to incorporate evidence-based best practices, innovation, and proven approaches within the TOC. The TOC narrative will also discuss issues of environmental sustainability, gender equality, and governance. A successful TOC example will be used to illustrate the narrative. Participants will have the opportunity to ask questions on the content and process. When: Wednesday December 19th, from 11 am – 11.45 am. Where: Online – Link will be provided after registration. Cost: Free for BCCIC members, $30 for non-members. The webinar will also be recorded and made available to BCCIC members who register for the webinar but are not able to attend.